Macaronesia is the collective name given to five chains of islands situated in the west central area of the North Atlantic Ocean. 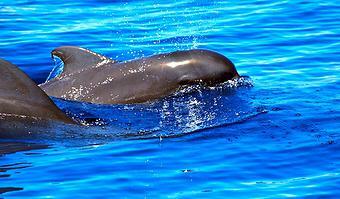 The islands are: the Azores, Madeira, the Selvagens, the Canary Islands and Cape Verde. 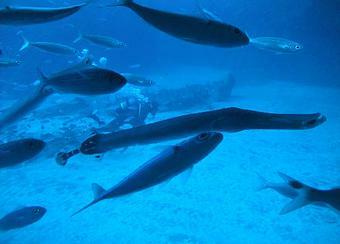 Out of the seven Canary Islands, Tenerife lends itself most to biological diversity, due to its unique climate and geography. There are many local weather conditions and micro-climates. The action of weather and erosion on the various volcanic rocks from which Tenerife is made also contributes to the presence of a wide range of soil types. There is, therefore, much rich and varied vegetation on Tenerife, with up to 140 species of plant being endemic to this island only. All these different factors contribute to the presence of many varied habitats in which widely differing types of plants and animals have thrived. 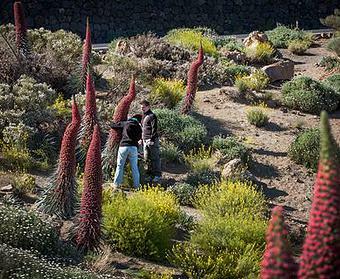 A heritage of 140 plant species that are exclusive to Tenerife gives the island the greatest wealth of endemic species in the whole of Macaronesia. The combined action of all the different weather-related agents on the variety of volcanic materials has also led to a wide range of soil types. The influence of all these different factors has generated a whole variety of habitats that shelter many different communities of plants and animals, whose interactions constitute the outstanding ecosystems of Tenerife. The vegetation of Tenerife can be divided into 6 major zones that are directly related to altitude and the direction in which they face. LOWER XEROPHYLIC ZONE: 0 – 700m. Xerophylic shrubs that are well adapted to long dry spells, intense sun-shine and strong winds. Many endemic species. Spurges, cactus spurge, wax plants, etc. THERMOPHILE FORESTS: 200 – 600 m. Transition zone. Moderate temperatures and rainfall. Area deteriorated by human activity. 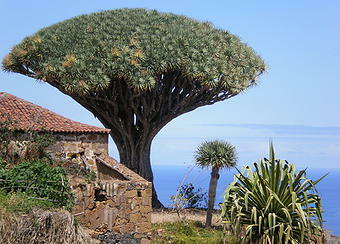 Many endemic species: Juniper, dragon trees, palm trees, etc. LAUREL FOREST: 500 – 1000 m. Dense forest of large trees, descendants of the Tertiary Age flora, situated in a zone of frequent rainfall and mists. A wide variety of species with abundant undergrowth of bushes herbaceous plants and ferns. Laurels, holly, ebony, mahogany, etc. WAX MYRTLE – TREE HEATH: 1000 – 1500 m. A dryer vegetation, poorer in species. It replaces the degraded laurel forest. Of great forestry importance. Wax myrtles, tree heath, holly, etc. PINE FOREST: 800 – 2000 m. Open pine forest, with thin and unvaried undergrowth. Canary Island pine, broom, rock rose, etc. HIGH MOUNTAIN: over 2000 m. Dry climate, intense solar radiation and extreme temperatures. Flora well adapted to the conditions. Endemic species of great scientific importance and beauty. Vipers bugloss, Teide white broom, Teide violet, etc.